This free algebra worksheets contains problems where students must find irrational and imaginary roots of polynomials. Problems include finding all roots, least positive roots, roots to 3 decimal places, finding 3rd degree equations given roots, and solving equations giving 1 root. 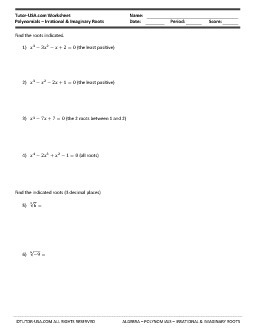 Solve the following equations given 1 root.